One item reported in the minutes from last council meeting is certain to have major financial repercussions in the years ahead. The timing, rationale, and the potential risks this decision embraces, says much about council’s decision making of the past, and the state of its current finances. Council borrowed $25 million at the astronomical FIXED RATE of 8.04% for 15 years under Newton. There is still a decade to go on this loan. Comments made in chamber over the past year or so indicated that council could not afford to get out of this arrangement without paying some hefty penalties (we believe in the order of $4 million). According to the draft Strategic Resource Plan (page 11) it will cost council $2.88 million in principal and interest repayments for 2016/17 and council would still owe at the end of the next financial year $18.71 million. Is negotiating another fixed rate contract nothing more than a long term gamble? What does this resolution say about council’s current financial situation? Will council be attempting to borrow another $6+ million to bring it back up to the original $25 million? Will council be paying interest on the interest? What penalty rates will the bank impose? If repaying the loan early is so vital, then why wasn’t this undertaken years ago? Could it in fact be related to the departure of Newton? Or is council so cash strapped that it has to do this now? Why is the Chief Financial Officer ALONE ‘authorised’ to ‘negotiate’ and sign off on the massive deal? Where is the full council in any such decision making? The history of council’s financial dealings are nothing to write home about. Readers should also remember that as a result of the $25 million loan for GESAC, council was unable to borrow (as other councils did at a much lower interest rate) to repay the $7.1 million Superannuation costs and thus were paying 7.5% instead of a far reduced interest rate if they could have borrowed this money. Ratepayers deserve nothing less than a full and comprehensive account of what is happening and why. God almighty!!!!! Unlike businesses, which are subject to economic circumstances, competition and consumer whims, financial markets generally consider local authorities to be better than blue chip. They have a captive market which gives them a guaranteed annual income, that rolls in on a quarterly basis and, until rate capping, could be raised annually regardless of the CPI. Council should have been able to borrow at lower than commercial interest rates and been able to negotiate favourable terms. The fact that Council wasn’t able to do so says heaps about the financial markets assessment of Glen Eira’s finances. Yet, despite that assessment Glen Eira still borrowed (they just didn’t reveal the terms). Now those who persisted in borrowing are suggesting rolling both the principal and excessive penalties into a consolidated loan so that they can pay interest on the penalties ie. continue to p*ss rate payers money away. Damn right ratepayers deserve to have this out in the open and while they are at it, lets also get a full independent commercial audit of Glen Eira’s finances and make that public as well. No more of the Lipshutz orchestrated internal audit crap. 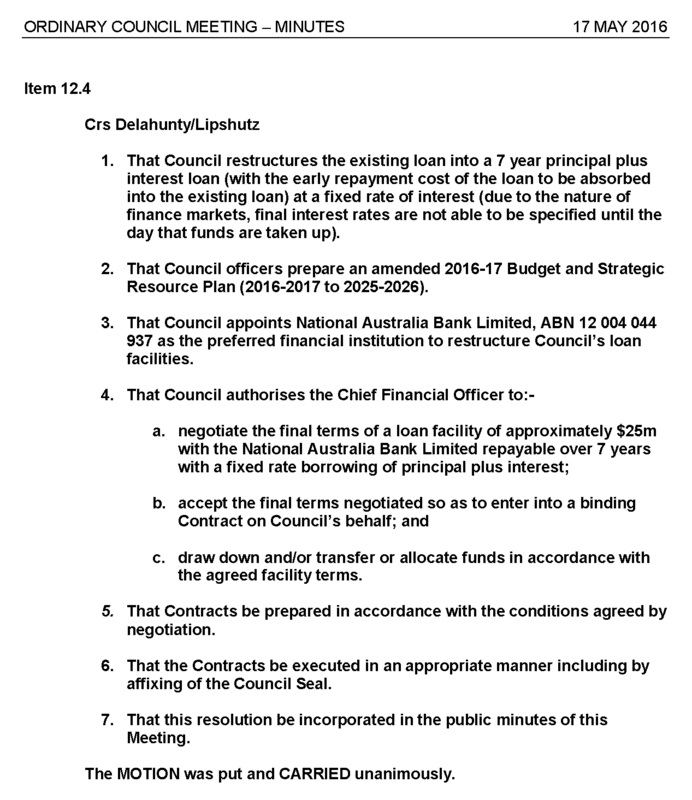 And then to top that all off, Glen Eira’s Chief Financial Officer, Swabey, the man responsible for the earlier loan negotiations and the state of GE’s finances, gets to fly solo negotiating the new fixed rate consolidated loan. And just where are our elected representatives, the supposed head of Council (the buck stops with them) in all this. Over in the corner turning their blind eye skywards while they ponder their re-election slogans. I want to know why if you are dealing with millions of dollars you don’t go out and canvass the entire market? They’ve nominated the NAB from the looks of things without even going to other banks. Yes all banks must be approached inorder to obtain the lowest raste possible. The rate of 8% on borrowings seems extraordinary as lenders can on earn about 3% currently from banks. This is a massive differnence! you can see what they are spending the money they are saving on rental! Council has a dismal record for large projects. The only winners are consultants, the legal fraternity, and the banks whilst ratepayers have the honour of keeping these people in jobs. And watching Glen Eira based sporting clubs losing out to non Glen Eira based clubs during the sports facility allocation process. Even though non Glen Eira based clubs fail to deliver and have to sub-contract their allocation to Glen Eira based clubs. Ain’t that right Burkie. Still they continue with this ego stroke! Business incompetents then , Business incompetents now, Bring on the next election and give these clowns the full flush. Um, at the risk of being crass, are you sure all they are stroking is their ego. Interest is the cost of money. The higher the risk, the higher the interest. Fixed or variable is hedging the bets. Lenders go for fixed if they think the interest rate will fall, borrowers go for fixed if they think the interest rate will rise. So here we have GE with shaky finances thinking they know more than the financial institutions and analysts. I’d say I put my money on the financial institutions and analysts but unfortunately I am not being given a choice. http://www.theage.com.au/victoria/lisa-neville-gets-police-minister-role-in-cabinet-reshuffle-20160523-gp1ap1.html Lisa Neville gains police, retains water and relinquishes climate change and environment. Lily D’Ambrosio retains energy, gains environment and climate change and new portfolio suburban development. wonder who will look after MRC interests now?